Grandeso de ica previdado: 455 x 599 pixels. Altra qualeso, en pixel-i: 182 x 240 pixels | 365 x 480 pixels | 456 x 600 pixels | 583 x 768 pixels | 778 x 1 024 pixels | 2 370 x 3 119 pixels. 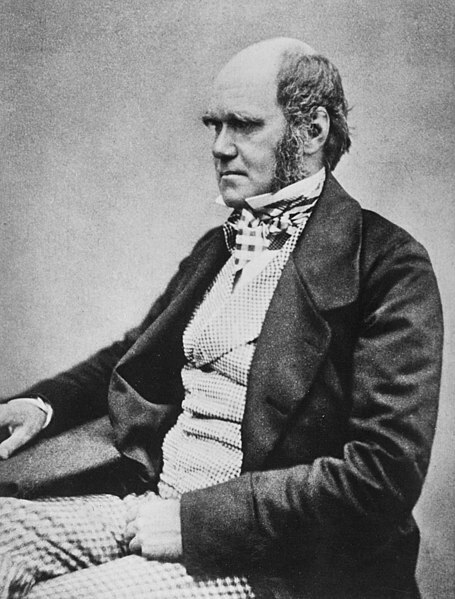 English: Photograph of Charles Darwin; the frontispiece of Francis Darwin's The Life and Letters of Charles Darwin (1887) has the caption "From a Photograph (1854?) by Messrs. Maull. And Fox. Engraved for Harper's Magazine, October 1884." In an 1899 paper, Francis Darwin wrote that "The date of the photograph is probably 1854; it is, however, impossible to be certain on this point, the books of Messrs. Maull and Fox having been destroyed by fire. The reproduction is by Mr. Dew-Smith, who has been at some disadvantage, having only an old and faded print to work from."